Insulating your attic is necessary if you want to keep the temperatures in your home comfortable all year around. Proper attic insulation can help reduce energy bills and keep you home safer and more energy efficient. There are however a variety of materials and methods you can consider when insulating your attic. Why Do You Need To Insulate Your Attic? The attic is typically the leading cause for most homes to lose heat in the cold months. And can be the reason your home stays hot and humid when it is warmer. Without proper insulation your attic could be costing you hundreds of dollars in utility bills every month. Insulation helps to regulate the temperature in your home. 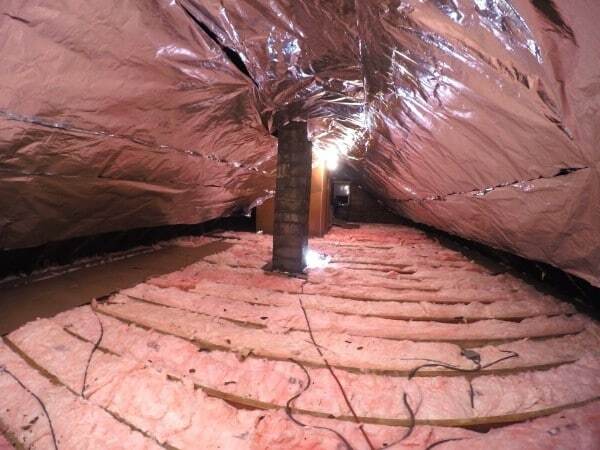 When it comes to insulating your attic you most commonly think of rolls of fluffy pink fiberglass material that you simply lay in the attic. There are however, a few different types of attic insulation each with its own pros and cons. These types of insulation also can be found in different materials as well. Cellulose- Cellulose is a highly recommended insulation material to use in your attic. The Cellulose insulation is made from mostly recycled materials. It is designed to be fire resistant and can help fight against bug infestation as well as prevent mold growth. Plastic- Plastic attic insulation not only can help regulate the interior temperatures of your home but also provide additional protection. The plastic sheets or vapor barriers help keep moisture away from the attic structure. Natural- Natural attic insulation is the most Eco friendly options you can choose when insulating your attic. Natural insulation can be made from wool, cotton and a number of other natural fibers. Some insulation materials are better suited for specific insulation types. There are a few different techniques you incorporate for better insulation of your attic. Blown in insulation uses special equipment to blow the insulation into the attic. This can be done on attic floors and walls in finished or unfinished attics. Cellulose is the best material to use with the blow in insulation method. Insulating your attic properly will ensure that there are no gaps or small spaces where cold air can escape. Fitted materials help better insulate your attic by cover the often overlooked features that can be affect your home’s energy efficiency. From fitted pipe covers to getting those hard to reach angles, fitted material will make sure every space is covered with insulation. A radiant barrier is a popular choice for insulation in areas that tend to get warmer weather throughout most of the year. An attic radiant barrier will reflect the heat from the sun away from your home. This will result in improved temperatures inside your home and can help reduce the risk of damage to air ducts. Attic insulation should be left to a professional attic insulation expert. This will ensure that you get the proper insulation cover to insult your entire attic without leaving any gaps or space. Attic Pro is a professional and trusted attic insulation company that serves the Houston area. They can assist you in decided which insulation is the best for your attic. Give us a call at 884-892-8842.